The Institute for Computational Medicine, launched last week at Johns Hopkins, will address important health problems by using powerful information management and computing technologies to produce a better understanding of the origins of human disease. Institute researchers plan to use this approach to identify disease in its earliest stage and to look for new ways to treat illnesses. The ICM is believed to be the first and certainly the largest and most ambitious research center of its kind. Its emphasis is on real-world health applications. "Our mission is to develop a new field that we call computational medicine," said Raimond L. Winslow, director of the institute. "We want to immediately tackle the challenges of how we can use advanced computational methods to analyze and model disease mechanisms. We want to be able to understand, quantitatively, how diseases progress. We want to be able to predict who is at risk of developing a disease and how to treat it more effectively." 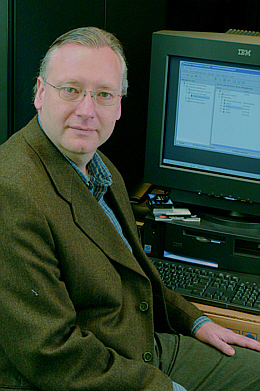 Winslow is a professor of biomedical engineering in the Whiting School and a pioneer in the use of computer modeling techniques to help understand heart functioning. The institute's co-director will be Aravinda Chakravarti, Henry J. Knott Professor in the School of Medicine and director of the school's Institute of Genetic Medicine. The Institute for Computational Medicine is administered by the Whiting School of Engineering but will involve a close collaboration with the researchers in the School of Medicine. "The formation of the ICM is a natural expansion of the long-standing and highly effective collaboration between Johns Hopkins' schools of Engineering and Medicine," said Nicholas P. Jones, dean of Engineering. "Over the course of the next decade, we believe that engineering and medicine will become even more interconnected and collaborative, and the ICM will be at the forefront of the exciting innovations we envision." At present, the institute is operating in existing university space. Its permanent home will be in the Computational Sciences and Engineering Building now under construction on the Homewood campus. The building is expected to open in spring 2007, with up to 11,000 net square feet of space reserved for the institute. This will include space for faculty and staff offices, as well as teaching areas. In place of traditional wet labs, the institute will operate high-performance computing and information storage labs. One of the institute's research thrusts is biological systems modeling. This involves the use of computer models to shed light on the molecular basis of human disease. Computer models allow researchers to conduct experiments and test therapies mathematically, in order to better guide experimentation. Computer models can also allow researchers to make numerous small variations and test large numbers of potential treatments to see which is most effective. The results can be passed along to other researchers who may apply them to living subjects. "We think this approach can accelerate the discovery of new therapies by guiding the experimental research," Winslow said. "We can help the experimentalists understand their data and target their tests more precisely. We may be able to identify a biological sequence of events that leads to a health problem, and thus suggest more effective therapeutics to treat these problems." A second research thrust at the institute is computational anatomy. In this area, researchers use computers and mathematical algorithms to analyze the structure of healthy and diseased segments of the body. These researchers then compare images of portions of the brain or the heart, for example, to see if structural changes coincide with occurrences of Alzheimer's or heart disease. If such changes can be identified, they may lead to early diagnosis of disease and earlier treatment. The institute's third research thrust is bioinformatics. Scientists in this field are developing new ways to mathematically represent and manage biomedical data as well as new approaches for discovering features of these data that are predictive of disease risk. Initially, about 20 faculty members are affiliated with the institute. It is expected to add six more faculty members over the next several years, with appointments in various School of Engineering departments. "We want these people to have very strong mathematical and computer science skills, in keeping with the mission of the institute," Winslow said. "But we will also be recruiting talented collaborators in the School of Medicine." Startup funding for the institute includes grants from the National Institutes of Health, the D. W. Reynolds Foundation and the Falk Medical Trust, totaling more than $8 million over the next five years. Researchers have begun applying for additional grants under the auspices of the institute. For more on the Institute for Computational Medicine, go to www.icm.jhu.edu. GO TO OCTOBER 17, 2005 TABLE OF CONTENTS.